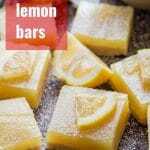 These vegan lemon bars are easy to make from simple ingredients! Bursting with zippy flavor, perfect for snacking or a light dessert, and a must-have at spring and summer gatherings. I don’t post that many dessert recipes, and when I do, I’m usually inclined to include chocolate, as you might have noticed! But lemon bars have a special place in my heart. At some point when I was growing up, my mom came across an awesome lemon bar recipe and it went into regular rotation. 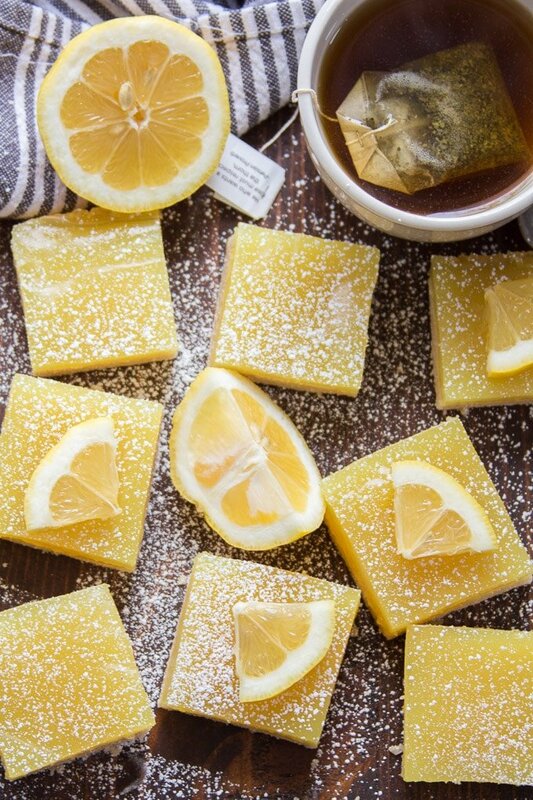 There was always a batch of her lemon bars at spring and summer gatherings. 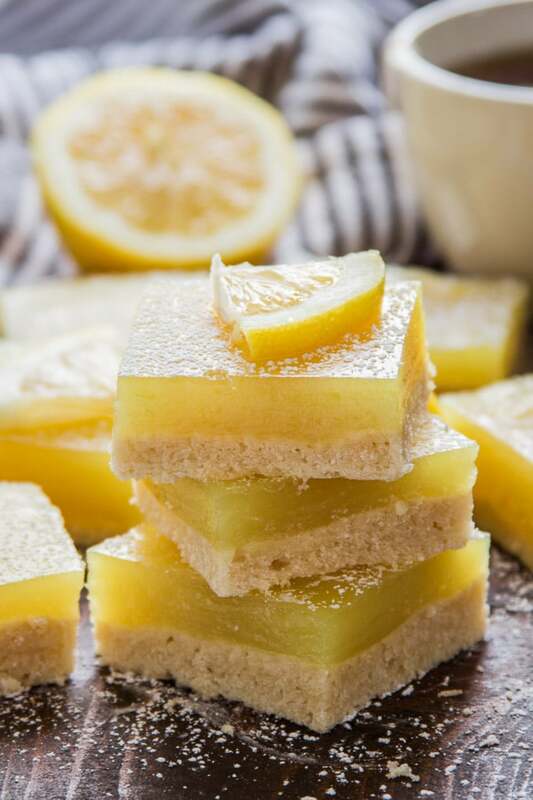 Spring is just about to start, so I thought it’d be a good time to come up with a recipe for vegan lemon bars, especially since veganism is slowly taking over my family. No, I didn’t end up including chocolate, but these were so delicious, I didn’t miss it! Classic lemon bars are made with a shortbread crust. This one is a bit lighter and fluffier than your typical shortbread crust, and I think it’s perfect for a light and springy dessert like these lemon bars. Start by beating some vegan butter and sugar with an electric mixer. Next, add some non-dairy milk. Beat everything until creamy, and slowly start adding flour, in 3 or 4 increments. By the time you get to the last flour addition, you’ll need to switch to a spoon. You’ll end up with a fluffy dough. Mix everything up and spread the dough into the bottom of a 9 x 13 inch baking pan. Bake just until the edges of the crust start to pull away from the pan. While the crust bakes, make the filling. Regular old lemon bars use lots of eggs. To replace the eggs, I used coconut cream and cornstarch. Coconut cream supplies richness (it’s very fatty, like eggs), while the cornstarch works as a thickener that enables the filling to set. To start, whisk your cornstarch together with lemon juice. 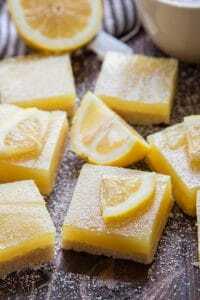 You’ll need the lemon juice to be cool in order for the cornstarch to dissolve. Set that aside and begin heating your coconut cream in a pot, along with some sugar, lemon zest and extract, salt and, optionally, a pinch of turmeric for color. Once the mixture starts bubbling, whisk in the cornstarch and lemon juice mixture. It should start to thicken up very quickly! Cook everything very briefly, then remove it from the heat and spread the filling over the crust. Pop your pan back in the oven and bake everything for another 15 minutes. The filling will still be pretty wobbly when you take it out of the oven, but it will set by the time your bars cool. Can I substitute non-dairy milk for the coconut cream? Maybe! I haven’t tested this, but I think it would work, although the filling won’t be quite as rich and thick. What’s vegan butter and where can I find it? It’s essentially dairy-free margarine (not all margarine is dairy-free), and most supermarkets carry it. Look for brands like Earth Balance and Melt. Why does the sugar need to be organic? In the United States at least, conventional sugar is processed using animal bone char, so it’s not considered vegan. Organic sugar is processed differently, using no animal bones. For a fun twist, add a teaspoon or two of powdered ginger to the filling. The bars can be kept at room temperature for 1-2 days, or refrigerated for a week. Begin by making the crust. Place the vegan butter and sugar in a large mixing bowl and beat at high-speed with an electric mixer, until creamy. Beat in the milk, just until fully blended. Begin beating in the flour, adding about 1/2 cup at a time and beating until fully blended before adding more. Sprinkle the salt over the last addition of flour before mixing it in. At this point, the mixture will be very thick. 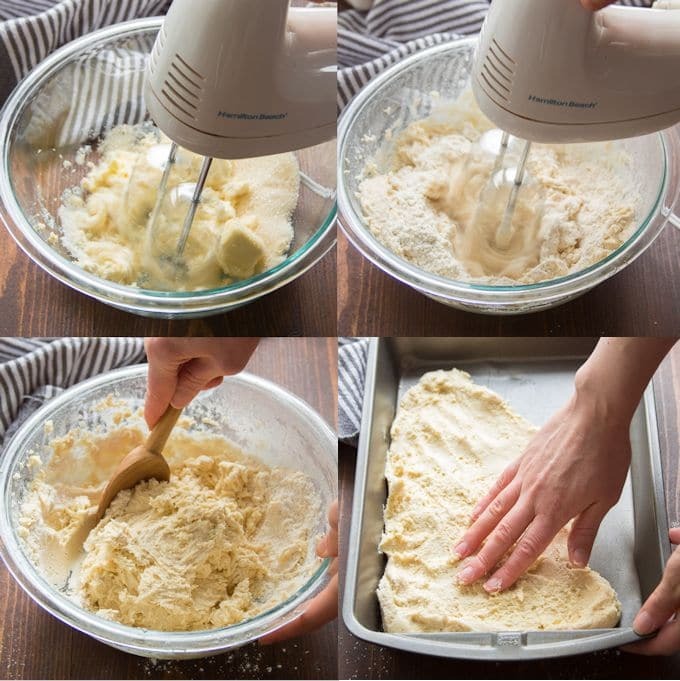 Set aside the mixer and stir the dough together with a spoon. Spread the dough in an even layer into the bottom of a 9 x 13 inch baking pan*. Bake for about 20 minutes, just until the edges of the crust begin to pull away from the sides of the pan. While the crust bakes, make the filling. Whisk the lemon juice and cornstarch together in a small bowl or large liquid measuring cup. Place the coconut cream, sugar, lemon zest, lemon extract, salt and turmeric, if using, into a medium saucepan and place it over medium heat. Slowly heat the mixture up, stirring frequently. After a few minutes the sugar should dissolve and the coconut cream should liquefy. When the coconut cream mixture comes to a simmer, stir in the lemon juice mixture. It should begin to thicken up very quickly. Continue cooking the mixture for about 1 minute, stirring frequently, until it becomes thick and glossy. When the crust comes out of the oven, spread the filling over it, using a spatula to smooth out the top surface. Return the pan to the oven and bake for 15 minutes more, until the filling becomes bubbly around the edges. Remove the pan from the oven and transfer it to a cooling rack. Allow the bars to cool completely. The filling will continue to thicken up as it cools. Slice and serve or store at room temperature in a sealed container for 2-3 days or in the refrigerator for up to 1 week. *I used a metal baking pan, and was able to easily remove the bars without them sticking. If you're using a pan made of another material or one that has a tendency for sticking, consider lining it with parchment paper. Delicious! A nice afternoon pick-me-up snack to make my work day a bit sweeter! Recipe did not say anything about preparing pan, so I didn’t. Was extremely difficult to remove bars neatly without leaving part of the crust in the pan. They were completely cool and I used a glass baking dish. Any suggestions to avoid this problem ? Otherwise, the bars are delicious. Can I cook It without the crust? 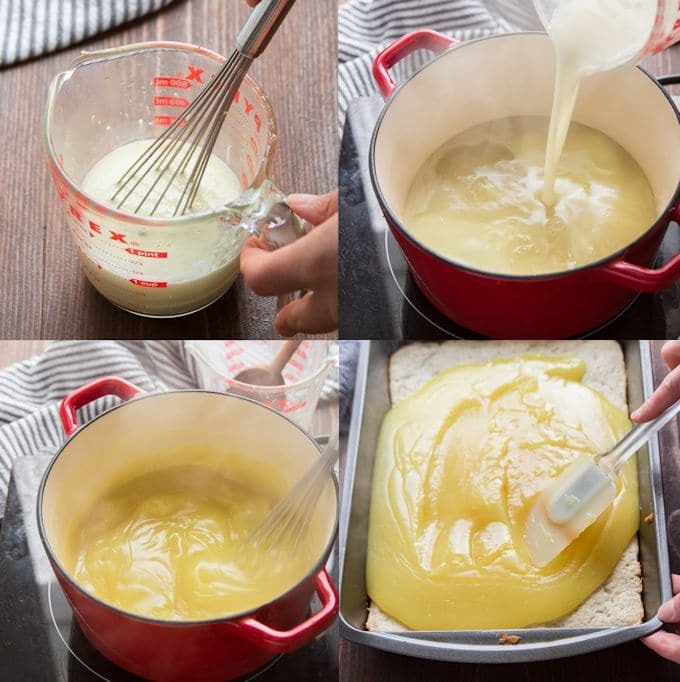 You can make the filling and use it as lemon curd, but I don’t think you’d be able to get it to hold it’s shape as bars without the crust.